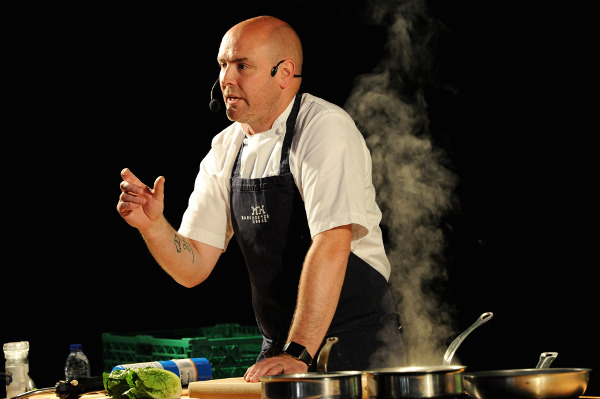 Aiden is chef patron of Manchester House, which has established a reputation as one of the best restaurants in the city centre, and a pop-up version will be appearing at this year's Bolton Food and Drink Festival. The festival, organised by Bolton Council in association with Aldi, takes place over August Bank Holiday (25 to 28). The -˜Made in Bolton restaurant will be in town on the Saturday (August 26), in the Festival Marquee, in Victoria Square. Aiden, who has been a regular at the festival since 2014, said it will be the first time that Manchester House has set up a dedicated pop-up. And he added that the festival is the best in the country. The sheer scale of the event is what I love. It is in my opinion the best food festival around. The fact that the whole town is consumed by food and drink makes it an absolute spectacle,- he said. Three menu options are available with dishes including shellfish bisque served with grilled Sicilian red prawns; braised beef cheek with Wagyu fillet tartar and Manchester tart. Wine will available to purchase. Dietary requirements can be accommodated. Aiden said: I will be in the kitchen for the whole day cooking and managing a full team of chefs. The food I cook is the food I love to eat. Im an honest cook who cooks from his heart so the diners are in for a treat. As we always do with our menus we will be using seasonal ingredients that are in their prime. It is the first time we are doing an actual pop up solely dedicated to us and I am both determined to enjoy myself but also deliver a true reflection to diners of what we deliver at Manchester House,- he added. Leader of Bolton Council, Cllr Cliff Morris, said: To have a restaurant of Manchester House's calibre coming to the festival for a dedicated pop-up is a real coup. The dinner costs £60 per person. There are six time slots for bookings, available in half hourly intervals from 7pm until 9.30pm. To book or make an enquiry, please contact marketingeventsteam@bolton.gov.uk. When you approach Tower 12 in Spinningfields Manchester it looks like a very normal city tower, don't be fooled. Inside lies a very special experience for both food lovers and lovers of a life with a view. Two stunning independently different environments the Lounge on level 12 and the Restaurant by Aiden Byrne on level 2.